I indulged in the guilty pleasure of reading Dragonslayer by William King, the fourth Gotrek & Felix novel, first published by Black Library in 2000. The novel was originally available as a singleton through Black Library, and then became available as the first novel in the Second Omnibus Warhammer edition with the sequels Beastslayer and Vampireslayer under the same cover. Sadly, the book is out of print, but used copies in good condition may be obtained through Amazon. I paid about $17 for my copy of the three novel Second Omnibus edition through Amazon, shipping included. Fans of the first three Gotrek & Felix novels as well fans of The Hobbit will enjoy Dragonslayer. The general plot is quite similar to There & Back Again, although the quality of the writing is more summer pulp than high brow traditional fantasy Oxford professor. I lost count of how many dwarfs populate the pages, but the star remains Gotrek son of Gurni, an avowed "Slayer," oath bound to seek out a glorious death in battle to atone for an unnamed dishonor. In place of the reluctant Bilbo, there is the equally reluctant happy hunter and poet warrior Felix Jaeger, oath bound to be the chronicler of Gotrek's eventual death. There is even an interesting wizard, though he is no Gandalf. The book ends with a battle similar to the Battle of Five Armies, though in Dragonslayer the armies total only three. Unlike The Hobbit, there is a little bit of romance involving Felix and a noblewoman warrior--an annoying bit of romance that did not do much to enhance or advance the plot. Also unlike The Hobbit, King adds a little steampunk to the traditional fantasy courtesy of an interesting, Scotty-from-Star-Trek-like dwarf engineer, complete with an outrageous Scottish accent, who introduces black powder bombs, gatling guns, gyrocopters, and a dirigible airship into the mix. King's description of a mid-air battle between the airship and the dragon alone is worth the price of the omnibus. While the plot compares with Tolkien's, the method of storytelling compares with George R. R. Martin's. Like Martin, King tells his tale from the points of view of all of the major characters and some of the minor ones in turns, occasionally devoting a chapter to a single character's POV as Martin does, but most often devoting a page or two or even just a paragraph to one character before moving on to the next. King does a good job with this. The storyline is not disrupted and remains easy to follow. I particularly enjoyed the points of view of the villains--almost enough to hope they would succeed in foiling the heroes. 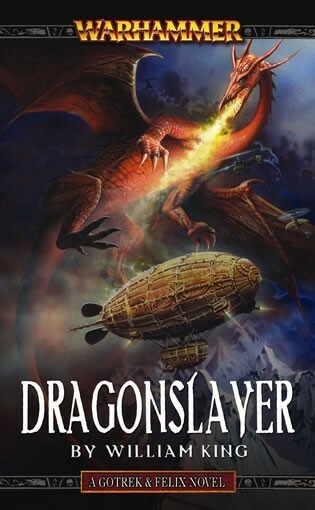 Dragonslayer is a novel that I would recommend to any fan of traditional fantasy looking for a quick, enjoyable, good summer read. While there is much that is familiar in terms of plot and characters, the familiarity is comforting rather than annoying, and there is enough unique material to keep fantasy fans turning the pages. Try reading it at the beach or in a comfy chair in a poorly lit room with a flagon of ale or, if you prefer, a bucket of vodka.